All current 5th grade parents are invited to join Mary Beth Abplanalp, Director of Youth Ministry, and Becky Page, Director of Children’s Ministry to explore ways to nurture your child’s spiritual development through adolescence, learn about our Youth Ministry, and ask questions. Join us in Valentine Hall from 8:30 – 9:30 a.m. for a pancake breakfast prepared and served by the 5th graders and JYF (6th – 8th graders). St. James’s will join the other Stuart Circle congregations at 9:30 a.m. in a walk on Monument Avenue. Join us at 10:30 a.m. for joint service of the Passion reading. The Children’s and Youth choirs will sing at this service. There will be a special Passion reading for the younger children in the Children’s Chapel. Join us for the third annual St. James’s Stations of the Cross Hike at Belle Isle on Saturday, April 15th at 11:00am. 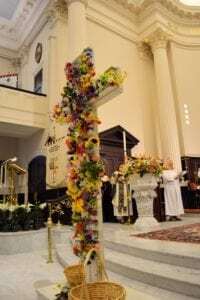 (Crosses were made by St. James’s Sunday school children.) Meet at 11:00 a.m. at the entrance to the Belle Isle pedestrian bridge (near 300 Tredegar St.) Stay afterwards for a BYO-picnic on the grass by the parking lot. The terrain is smooth and level, so strollers, walkers of all ages, and four-legged friends are all welcome! Easter is on Sunday, April 16 this year. At the 9:00 a.m. worship service the children are invited to process with their mite boxes to flower the cross. Children will gather in the basement of the Michaux House at 8:40 a.m. to decorate Mite boxes with flowers. Please bring flowers from your garden or the grocery and maybe extras to share. 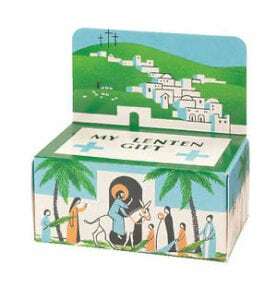 Mite box offerings will go to ACTS one of St. James’s partners in ministry. 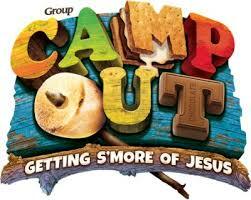 Youth in 4th grade through 12th grade are invited to participate in VBS as volunteer counselors. They will spend the week with the children of St. James’s, have a great time with other counselors, and earn community service hours too! Click here http://www.lifeway.com/kidsministry/2014/03/31/easter-recipe-resurrection-rolls/ for the recipe for Resurrection Rolls that the Growing in Faith classes (2nd -5th grade) made as part of their Lenten lesson. They are yummy! Parents are welcome to leave children- infants to 3 years olds- with our qualified staff caretakers in our Nursery, free of charge, while they attend worship or other church events. Regular Nursery hours are Sundays from 8:30 a.m. to 12:30 p.m. (9:30 a.m. – 11:30 a.m. in the summer). The Peterkin Parlor (located below the sanctuary) is a space where parents are welcome to tend to their child’s needs –nurse, let their wiggles out, or quiet time away – while listening to the worship service. This room is not staffed by caretakers but has toys for little ones to play with. Need a Family Get-away Weekend? Each fall (October 20-22, 2017) St. James’s parishioners go on a Parish Weekend to Shrine Mont, the retreat center of the Episcopal Diocese of Virginia, located in the Shenandoah Valley. For families with kids, it is a chance for kids to be together and play in lightly structured ways. 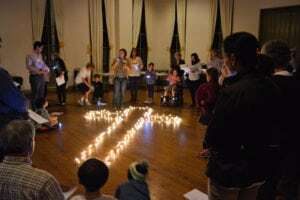 Whether it is walking the labyrinth for the first time, fishing in the pond, sharing their pumpkin carving talents, or seeing the stars from a mountain’s height, kids and youth experience the love of a parish family and God’s love for them. We stay in modest, clean, and charming hotel rooms and cottages and delicious Southern meals are served in the dining hall. Quality time away from our busy lives is hard to come by but this is your golden opportunity! Pre-registration will be available soon. Want more information already or want to volunteer to help out? Contact Hilary Streever at hstreever@doers.org. Did you enjoy the information and resources in this eNewsletter? Did you have an announcement or resource you’d like to include in the e-Newsletter? Please email your feedback to Becky Page at bpage@doers,org. Deadline for content submissions is the 15th of the month prior to publication.